Well, I’m a few days late with this post, but I have a good excuse! I enjoyed a lovely long weekend with my Mom and sister at Lake Tahoe. We had a wonderful time relaxing, sightseeing, laughing, drinking wine, and eating. I had been looking forward to making Veal Marengo ever since my Mom made the recipe in November. 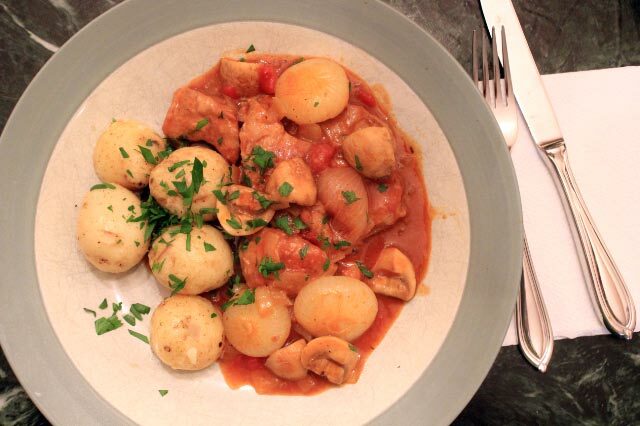 It reminded her of a veal stew she had in France last Fall, and she loved it so much she made it again a month later. She gave me a great tip to use veal stew meat in place of the shoulder, which is harder to find. Veal Marengo is a pretty simple stew, but I felt that the execution was a little fussy and used too many pots and pans. While the veal stew meat is simmering in a mix of onions, tomatoes, tomato paste, white wine, and herbs, the rest of the vegetables are each cooked separately in their own pots. The cipollline onions were cooked until glazed with butter and the mushrooms sauteed until tender. The potatoes were boiled, then drained and coated with butter. After the veal is tender, the onions and mushrooms are added. The potatoes are served on the side. If I make this again, I will definitely streamline the recipe. I would cook the cipolline onions in the pot with the veal. I might still saute the mushrooms, because I think they benefited from that extra step. 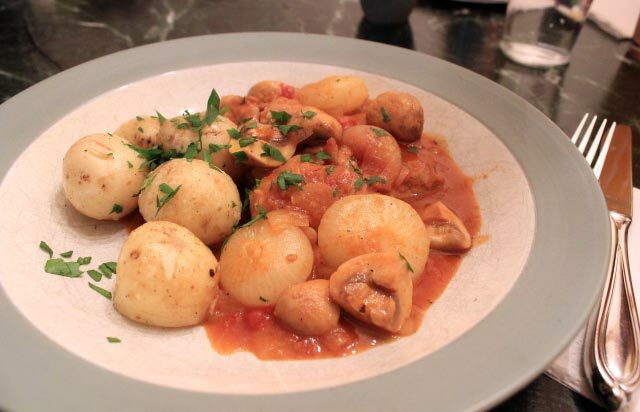 My husband and I agreed that we would have preferred the potatoes cut into smaller pieces and mixed into the stew, so I would probably cook those directly in the stew too. I thought this stew was delicious! I loved the mild flavor of the veal, and mushrooms are a favorite of mine. This post participates in French Fridays with Dorie, an online cooking group making our way through Dorie Greenspan’s Around My French Table. We only have 9 recipes to go! 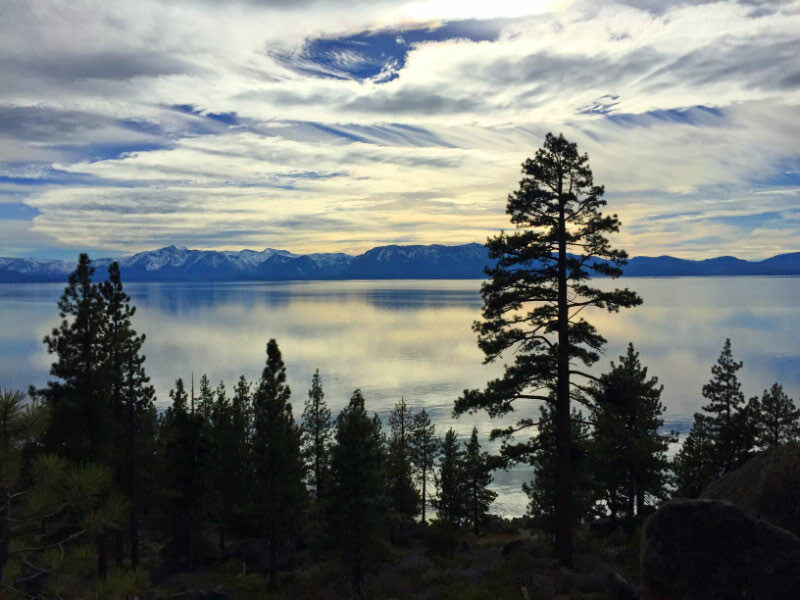 Before I go, I can’t resist sharing this photo I took at Lake Tahoe the other day. The lake was still and beautiful and the clouds were very dramatic! For French Fridays with Dorie this week I am doing yet another double post. This week’s recipe was a green stew called Green-as-Spring Veal Stew, except I used beef. I also made a recipe from earlier this month, a simple cake called Visitandine. Green-as-Spring Veal Stew was unlike anything I had made before. It calls for veal stew meat, but I used grass-fed beef chuck roast instead, which I cut into 2-inch cubes. The main reason I made the substitution is that I had the chuck roast in the freezer just waiting to be used. It sounds like several FFWD participants made substitutions for the veal – I can’t wait to see what the others used and how it turned out! So, back to the recipe… First, the stew meat is boiled for just a minute or two, then drained and rinsed. This rids the meat of any impurities that might cloud the sauce – very clever! Next, the meat is simmered in broth with a variety of veggies and seasonings until it is tender. When the meat is done, it is removed from the broth, and the veggies and seasonings are discarded. Here’s where it gets interesting (and how it gets green): After the broth is reduced a bit, a bunch of fresh greens and herbs are added (arugula, spinach, dill, parsley, and tarragon). After cooking briefly the whole thing is pureed (minus the meat!). Whisk in some creme fraiche and squeeze in a bit of lemon juice, and the sauce done! I liked this a lot! I was concerned that the flavor of the beef would be too bold for the sauce, but it was not at all. The sauce was fresh-tasting and delicious! I can imagine using it for many different meats, including chicken. It’s also a good way to sneak spinach and arugula to wary eaters! If you are curious what other meats were used, check out the “LYL” on the FFWD site: LYL: green as spring veal stew. I am always amazed at how many wonderful things can be made from just a few simple ingredients: eggs, flour, sugar, and butter. Visitandine is a perfect example. This simple cake is easy to make and easy to eat! This cake is made with whipped egg whites, and the recipe is similar to Coconut Friands and Financiers. Because it is a simple, vanilla-flavored cake, it is very versatile and can be served many ways. I made this for Easter dessert and served it with whipped cream and strawberries. Kind-of like an unlayered shortcake. While I enjoyed it served this way, I liked it even better the next day eaten out-of-hand as a snacking cake. I loved letting the simple flavors shine on their own. If you are looking for a last-minute dessert made with ingredients you have on hand, give this delicious cake a try! I guess the words flowed OK…maybe too well! This French Fridays with Dorie recipe was supposed to be Veal Chops with Rosemary Butter. As you can see from the photos, those are not chops. I could not find veal chops locally, but I did find some fresh veal scallopine. I would love to try this recipe with veal chops some time, because the photo in the book looks incredibly delicious. The scallopine were a very good substitution. Very quick to cook on the stove, and probably “lighter” than the chops would have been. Once again, a simple recipe from Around My French Table. After marinating in olive oil, rosemary, and thyme for the day, the veal is quickly seared in a skillet on the stove. A quick pan sauce is made, then the meat is topped with a delicious rosemary butter. I did have to leave off the pan sauce. During the searing process my pan got a little too blackened, and the sauce ended up tasting like charred water. Not good! I served the veal with mashed potatoes and steamed green beans (both fresh from the garden!). The herbed butter tasted good with everything on the plate. It was a lovely meal!